Healthy eating should be a natural part of living. However the types of food we eat can and will affect your body, your mind and your energy. If you are a person who feels the cold then eating ice cream on a daily basis will make you colder. If you are a person who feels the heat, then eating hot spicy foods will make you more hot and explosive in nature. What you eat affects your well being and personality. Nowadays there are more diets and eating programs from around the world than can be counted. From Paleo and raw food diets to cabbage, baby food and Atkins diets. Many are very strict, hard to maintain and unrealistic to implement if you have a family to feed. The reality is that keeping it simple and practical is means your diet is less of a ‘diet’ and more of a way of life. The palm of your hand is the best way to measure a snack such as nuts and seeds. Meat is best the size of your palm, with the rest of your plate containing salad or vegetables. White meats are not as heavy to eat and is less arduous for your body to process. When you look at your food to eat, ask, “Is it from God’s Garden”? or “How much human interference is in this food I am about to eat?” The more processed or human interference, the less goodness there is in your food. The busier we are in life, the less time we tend to allow to sit and eat. Many of us eat on the run or in front of the television to achieve more at once. Take the time to eat at your table for your meals and allow a moment to focus on you, your family and the nourishing meal you are eating. Speaking calmly and being relaxed during a meal will aid your body’s digestion process. Chewing food helps to relax your body and mind and as you chew, your saliva mixes with the food in your mouth. This process creates greater warmth and assimilation before reaching your stomach and is the first stage of the digestion process. Do you remember your mother telling you to chew your food? There are some quotes out there to chew 30-50 times each mouthful. Remember, your stomach does not have teeth! How you feel when you are preparing your meal will affect the taste of your food. Put love into your food and it will be nourishing to your body. Water is a valuable tool to heal and hydrate your body. If you are feeling tired, take note of how much water you are drinking. You should drink 1.5 to 2 litres a day. If you work outside in the heat you will require more water. Drinking a glass of water before meals can help to fill your stomach to give you that feeling of fullness. Consider about how big is the plate that you using to eat from. In the past our plate sizes were smaller and less was available to us so we ate less. Changing to a smaller plate size is a simple way to control the amount of food eaten. Each food takes a different amount of time to be processed from your mouth to your bowel ready for elimination. For example fruit should only be eaten on its own or before meals, as fruit only takes 40 minutes to be transported from your mouth to stomach and then to the bowel. If fruit is eaten after a meal, it sits on top of the other food where it can ferment, as the fruit cannot break down before the other food. For further information about food combining please ask for a chart to follow from Banksia Healing Centre. It is important to eat a wide range of different foods types – not the same ones, day in and day out. Variety gives us the ability to absorb the different vitamins and minerals needed for wellbeing. This includes eating foods of different colours including yellow, orange, green, red, and blue/black foods. These colours affect different organs in your body and can be used for healing. There are certain foods that are more suitable for different types of people. 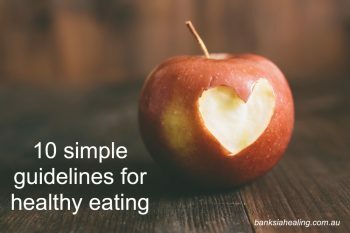 If you are not sure which is right for you, contact Banksia Healing Centre and we can discuss the right food options for you. At your next meal, have a close look at your plate. What are you about to consume? Does it look like nature intended or has it been highly processed with more additives than real food included? What sits on your plate is a reflection of you, your choices, your health and how your will look and feel. You are only given one body, it’s important to nurture it. The ten tips are good. Most is familiar to me from my detox with Banksia. I would however like to have a copy of the chart on Food Combining. The workshops certainly sound interesting but a pity that I cannot attend the first one in June. Thank you always for the information for a healthier me.